I'm not sure if I am going to be able to articulate what happened yesterday, but let me try. This story began when we first got to Japan last August. Yumiko goes to a school two miles from our apartment. At first she took the train, but one morning Ken's brother Tokuya San showed us the way to walk, which follows a major street and then up a long hill. Once you get to the top of the hill you come to the edge of Arisugawa Park. The school is still another third of a mile from Arisugawa Park, but this story is not about Yumiko's school, it's about the park. Arisugawa is one of the prettiest spots on this earth. It was once the property of a feudal Lord, but for the last several decades the city turned it into a public park. 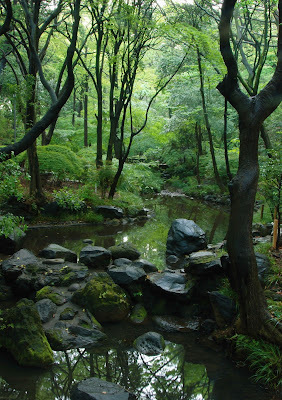 It is filled with beautiful old trees, a long winding stream that begins at the foot of a waterfall, a pond filled with turtles and ducks and all kinds of fish, paths and bridges and steps that lead up and down and all around. 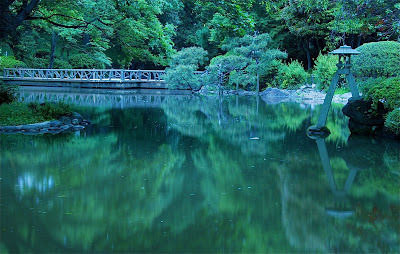 It is just like you would think an exquisite park in Japan would look like. Well, I fell in love with Arisugawa and began walking Yumiko to school every single day and often would stop in the park with my camera and my tripod. I felt so at peace in the park. I loved that I could take photos of anything and everything and didn't have to worry about talking to anyone. 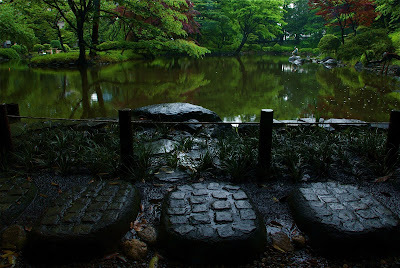 I had found a beautiful, diverse place that was so Japanese where I could just learn how to be a better photographer. One day I met a woman named Jou (pronounced Joe). I have talked about her before in this blog. Jou feeds the stray cats and crows and birds. She knows every cat and duck and crow in the park. She raised a beautiful daughter by herself and has overcome great odds to become a very happy, lovely woman. She and I became good friends over the last ten months, so I wanted to make her a present before we go home. I decided a few months ago, I would make her a book of photographs of Arisugawa. So, for many weeks, I have been spending at least an hour each morning in the park taking photographs with my long lens and my tripod. Photos of the trees, the pond, the bridges, the pathways and the cats and crows and ducks and turtles. What I have not mentioned is the group of fishermen who are also always in the park every morning when I go there. They sit on the bank at different parts of the pond and fish. They are the same old guys who just love to fish and talk. They catch the fish and then throw them back in again. I have wished, wished, wished that I spoke Japanese so I could ask them if I could take their picture. But I still know very little of the language and so have never spoken to any of them. I feel quite shy, but I know they know I am there. Every once in a while, I have been high up on a ledge or down low at the water's edge taking photos and once in a while I will take a long far away shot of the fishermen, but I don't want to be rude, so I have avoided taking their pictures. However, when I am taking photos, the ducks and birds and turtles are all around the fishermen and I have not been shy about taking those shots. Well, one day I asked Jou if I could take her picture for one of my photo assignments and she of course said yes. I told her about the fishermen and she said she would be happy to ask them if they would let me take their picture. Now we are getting to the point of this story. I have been away from Arisugawa for the last two weeks. I never did get to take photos of Jou or the fishermen. But I did finish the book and had it printed and delivered. Yesterday I took the book to Jou. She ran up to me and was so happy to see me because it had been such a long time. I gave her the book and she just pressed it to herself and was so appreciative. I told her to wait and look at it when she has time, because I knew she had to go to work. She then told me that she had talked to the fishermen about me. The fishermen told her they knew who I was. They told her they were very disturbed by me. They didn't like me lurking around the park everyday with my camera and tripod. They felt I had disturbed their peace. They thought I was sneaking photographs of them and that one day their picture would end up in some foreign magazine that would denigrate old retired Japanese fishermen. They thought I was just a very rude American. Well, I was floored. I just felt so, so awful. Tears welled up and I didn't know what to say. I told Jou that I did not mean to disrupt the peace in the park and that I so wish I could speak Japanese so I could tell this to the fishermen. I was so embarrassed. She said not to worry about it. But you can not imagine how terrible I felt and still feel. I walked home without taking any pictures at all. I didn't even take my camera out of the camera bag. I was too embarrassed to tell Ken what happened. I just remained in a bad mood. The mood continued through lunch and dinner. I felt so awful. I went to bed early, but could not sleep - just thinking about the fishermen and how I had become a pariah. This morning I woke up - not sure what I was going to do, but at breakfast I decided if I was to lift this cloud, I might as well tell Ken and Yumiko. I told them and Ken said I absolutely have to go back to Arisugawa and talk to the fishermen. He said he would go with me and interpret as I talk to them. I told him - NO WAY. I am not going back to Arisugawa. I told him he should not tell me what to do. I confided in him because I knew he would be a good listener, but I didn't want him to find the solution for me. He said O.K., but then Yumiko said, "Well Mom, what ARE you going to do?" Kitty, here's my two cents worth. (I am one of those people who always seems to have a couple of pennies I'm trying to give away; sorry.) I have a suggestion for helping everyone feel better here. If it doesn't feel right to you, ignore it and please excuse me for stepping in where perhaps I should not have. But this is my thought: Go back to the park with Ken, but don't go empty-handed. Bring photgraphs showing how you've captured some of the beauty of the park, and give one to each of the fisherman as a gift. Let Ken translate, and explain that you too love the beauty of the place, and that's why you take the pictures. You never intended to disturb them, and would have told them so earlier, but you didn't have a translator present. They have resented you out of a misunderstanding, out of fear of the unknown, perhaps out of experience with condescending foreigners. It might be a good experience for all of you. But work things out as feels most right for you. bring truth to power. Your work will speak volumes and communicate across whatever cultural borders. Give the fisherman a photograph and they just might teach you how to fish. It is a glorious world which we all share. May we find a way to simply talk to each other across whatever fears we have of each otheer.